New Orleans As the international work percolates along let me share a couple of notices on campaigns that are stirring in Toronto in an exciting campaign that is leverage political strength to win tenants rights and of course our on-going effort to force there to be accountability in India before there is an relaxation on foreign direct investment in retail. AMRITSAR, India — That’s not to say everyone is welcoming Wal-Mart. India Foreign Direct Investment Watch, a national coalition of labor unions, environmentalists, nonprofit groups and academics, has said that the company will eventually hurt shopkeepers, even if its store is not open to everyone in the general public. “Wal-Mart’s sheer size gives it unrestrained economic power, which allows it to drive down costs in the retail and manufacturing sectors and to enact its own standards with regards to its work force,” the group said in a statement. A Toronto poverty group wants to vote in a better life for those in need. 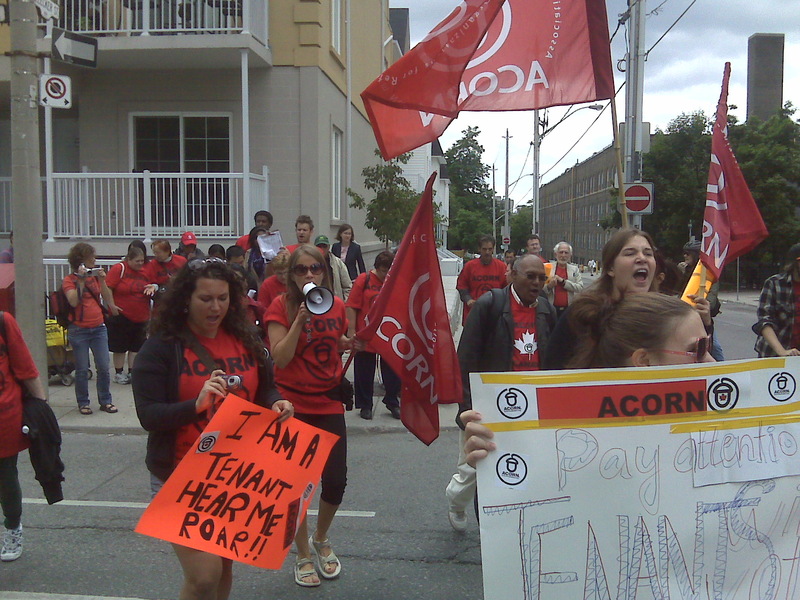 The Association of Community Organization for Reform Now (ACORN) says it is tired of slum landlords and plans to use the 2010 municipal election to force local politicians to improve their lives. “We plan to go door-to door to improve voter turnout and gain power for tenants using the upcoming elections,” ACORN spokesman Tatiana Jaunzens said yesterday at a downtown rally. ACORN says only 186 of the 5,000 rental properties in Toronto will be inspected this year. “At this rate it will take 34 years to have them all inspected,” Jaunzens said, adding the city needs to increase funding for its building inspection program. The organization will run a campaign to increase the number of votes cast in areas with a high density of poor quality buildings in an effort to elect candidates who support tenant issues, added ACORN member Marva Burnett. “It is time the politicians started listening to all their constituents instead of just some. There are so many of us living in slum buildings in this city,” Burnett said. Toronto Councillor Janet Davis, who represents Beaches-East York, agreed the election provides advocates with a way of increasing the power of tenants. “Fifty percent of the city are tenants who don’t have a voice. Getting out to vote will make a difference because there are too many bad landlords in this city,” Davis said. Laura Howell lives with her daughter and mother in a run-down building in the Danforth-Victoria Park Aves. area and said she deserves to live in a clean home. “The place is falling apart, it is cockroach-infested and the repairs don’t get done. We are second-class citizens that management doesn’t want to hear from. The only time we will see them is if the rent is late,” she said. 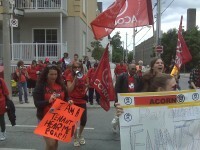 This entry was posted in Community Organizations International, Community Organizing, Financial Justice, Organizing, Protests, voting rights and tagged ACORN Canada, COI, India FDI Watch Campaign, wal-mart by wade. Bookmark the permalink.